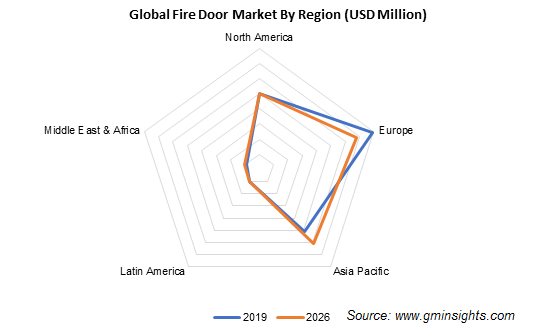 Global Fire Door Market size was valued at over USD 10 billion in 2017 and is expected to witness significant gains at around 7% CAGR from 2018 to 2024. Growing awareness on building safety and initiatives to minimize property damage during fire accident will drive the fire door market demand. Increasing construction spending on commercial & residential buildings coupled with government expenditure on infrastructure development will stimulate market growth. According to the World Bank, the global construction spending is expected to reach USD 15.88 trillion by 2024, which will stimulate product demand. 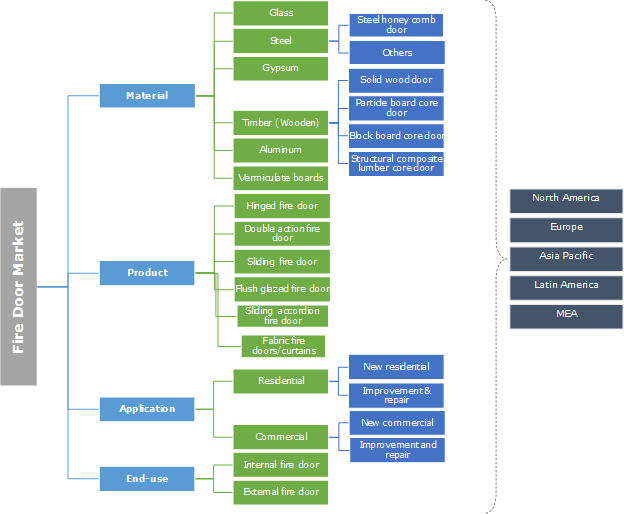 The rising demand for commercial and residential spaces equipped with harm resistant features is a key trend shaping fire door market dynamics. GDP growth among developed and developing nations along with the mandatory installation of fire doors in public and commercial buildings has positively enhanced product penetration. The rapid expansion of the construction sector in-line with smart city projects are expected to create new opportunities for industry players. As per, the International Data Corporation, the global smart city initiatives attracted technology investments at over USD 81 billion in 2018 and are projected to exceed USD 158 billion by 2022. Fire door manufacturers are anticipated to gain an advantage by entering into partnerships with construction companies over the forecast timeframe. Superior safety, lightweight features, along with advancements in the production facilities are key trends followed by the industry players. Manufacturers are continuously focusing on product development and visibility by offering the products through online portals and uploading their catalogs on web portals. Collaborations with the architectural firms for new constructions is a key strategy adopted by fire door manufacturing companies to improve their profit margins. In addition, key fire door manufacturers are investing in capacity expansion and hiring industry specialists to gain a competitive edge. Stringent building safety regulations around the globe will further support the fire doors demand. Fire doors are classified under passive protection components as these do not self-activate during the fire or raise any alarms; however, they reduce the spreading of fire. These are regulated under the International Business Code (IBC) laid by the International Code Council (ICC). Moreover, stringent regulations necessitating the installation of the fire door resistant system in commercial buildings for issuing the permit will stimulate product penetration. However, the fluctuating raw material and labor costs are restraining factors affecting the profitability of the industry participants, which in turn affects the fire door market growth. Steel accounted for around 43% of the fire door market share in terms of volume in 2017. Steel fire doors are mostly utilized owing to superior safety, enhanced aesthetics, and optimum functionality which in turn will significantly drive the overall industry growth. Ease of customized design, matching the interior of the residential or commercial areas will further enhance the product demand. Strength along with durability is a key factor that will influence the customers’ preferences for steel doors. Glass as a manufacturing material and is expected grow at 7% from 2018 to 2025. The advancements in the manufacturing process and technologies eliminating conventional thick, wired, fire-rated glass with wireless distortion-free glass will supplement high penetration. In addition, these products also offer a superior surface finish, enhanced visibility, and low reflection, providing clarity to the door during emergencies and during daily functions, thereby augmenting demand. Hinged fire door market was over 12.5 million units in 2017 and is expected to grow at 6% from 2018 to 2024. Hinged fire doors are among the most prominent choices considering the ease in functionality, along with a superior load-bearing capacity during fires. Cost-competitiveness of the product as compared to other counterparts will further fuel the product demand. Developments in the self-lubricating bearing are among the popular trends adopted by the industry players. This eliminates the maintenance of the doors and stimulates product penetration. The flush-glazed fire door market is estimated to witness high growth during the forecast timeframe owing to superior insulation as compared to its counterparts. Increasing demand for doors that offer safety and have lightweight applications will positively drive product penetration. Moreover, consumers focusing on cost-effective applications, particularly for the replacement in commercial and residential sectors will generate a high adoption rate of the product. Commercial application accounted for 75% of the fire door market share in 2017. Advancements in building standards focusing on the safety and security coupled with an upsurge in environment-friendly materials are among the major industry trends stimulating demand. Numerous industry players are moving toward opportunities to deliver products, upholding the overall theme of the commercial building, further boosting the industry growth. The growing demand for safety-focused products, particularly in the latest residential constructions will propel the overall residential fire doors market growth. Increasing disposable income is a major factor driving the trend. Door dealers are focusing on the residential sector due to higher profitability, which in turn boosts market growth over the forecast timeline. External fire door market held the largest share in the end use segment and is expected to surpass USD 14 billion by 2025. External fire doors account for a major share owing to mandatory installation in commercial buildings. Appropriate tests prescribed under the standards are well performed on these doors and they are upgraded as per the requirements, capability, and operating function of the buildings. Europe accounted for 32% of the market share in terms of volume in 2017 and is projected to grow at a steady pace over the forecast timeline. Strict building safety regulations in the region will drive the fire door market. Recovering economy along with a promising demand from infrastructure development will further enhance the product growth. Asia Pacific fire door market accounted for over USD 5 billion in 2017. Rise in consumer awareness, increasing regulations on building safety and changing preferences for safety and precaution-oriented products are key factors driving the regional growth. For instance, in Japan, the Building Standards Law needs contractors to install doors particulate certified as fireproof by the Ministry of Construction (MoC) when the building is in a densely inhabited area. Additionally, the expansion of the regional economy along with increasing disposable income directly results in a rise in infrastructure development, which in turn, propels product penetration. The global fire doors market is characterized by the presence of a few dominating companies such as Assa Abloy, Hörmann Group, and Agata Record AG. They rely on strategies such as new product launches, geographical expansions, R&D investments, and mergers & acquisitions to enhance their market share. There is an extensive unorganized sector present in this industry, which will impact the existing market players. To overcome this issue, they resort to long-term partnerships and supply chain agreements with the suppliers and distributors to ensure an efficient flow of their products across all regions. This will enable them to mark their presence and strengthen their position over the forecast timeframe. The regulations on fire & safety have a profound effect on shaping the market dynamics of the fire door. Manufacturers must conform to and base their product development & innovations based on the standards prescribed by various bodies such as the NFPA. The industry has a very fragmented and complex supply chain network with many stages that are often outsourced. A diversified product portfolio, geographic presence and the establishment of an effective distribution channel are crucial factors that enable players to sustain in the fire doors market.